Take the tops off of your pudding cups and fill to the top with your crushed graham crackers to look like sand. Stick your umbrella into the sand with a gummy life saver next to it. 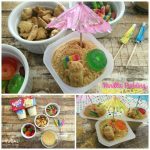 Serve with a spoon and enjoy these cute little beach treats!